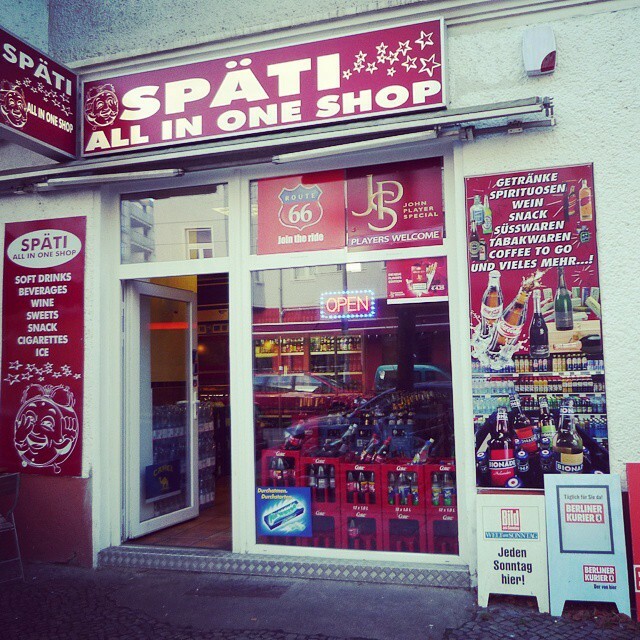 Home / #Social / Drinking Culture: Why You Should Support Your Späti! Whether you are a bar worker finishing a shift at 6am, a cash-poor hipster with a penchant for Sterni, or heading to another long line with a 50/50 chance of rejection, the late night lights of a Spätkauf are a welcome sight in this 24-hour city. But, you may have noticed, since the beginning of the year, the glow from some of these temples has been dimmed. This is down to a new Sunday closing law that has been sporadically enforced on these institutions. Though this may seem to be fiction in certain districts, it is very much a reality. Basically, for a Späti to sell alcohol or tobacco on a Sunday, they now require a license to do so. The thought process of a politician from a small town in coming up with this law is not hard to imagine. Teenagers drinking on the streets must be a problem for a well-ordered place like Munich, but to apply the same logic to Berlin is absurd to anybody who has lived here. Berlin´s drinking culture is wholly different from places like Manchester, London or Dublin. The mix between late bar opening hours and the Spätis seems to keep the pitted violence that prevails in these and other cites at bay. Warschauer Brücke has become a bit of a mess over the past few years, but the five minutes that it takes to cross it are jovial compared to Temple Bar at closing time. Spätis are not just places to pick up your beer and go; they are, in a lot of cases, the small hubs of a community. Almost everyone has their favorite, on and off their street. A throwaway conversation with your Späti guy can make your day. Sitting outside on a hot summer night can lead to new friends or who knows what else. The loss of Sundays or, quite possibly, restrictions on opening hours from 10pm until 5am would be devastating, not only to Berliner culture but also to the small businesses that support it. The owners of these businesses have banded together to fight against these senseless, draconian laws and put together a petition to help save their livelihood. I have signed it (which is something I would rarely do) and urge you to do the same.